The club had never hiked this route before. To get to the Goshen Pass Natural Area Preserve involves taking I-64W and I-81S to Exit 205 (Raphine) with a right onto Route 606 followed by a left onto Route 39 (to Goshen) to a gravel road that leads to Virginia Wayside. The drive proved quite picturesque once we left the freeways behind. 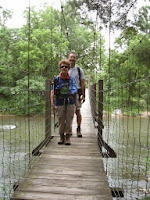 We started our hike by crossing an awesome swinging bridge. 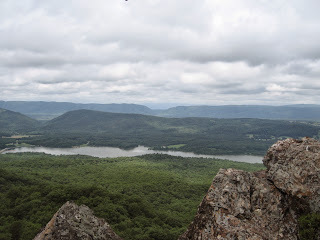 After that, the hike was punctuated by three gorgeous viewpoints, which provided wonderful lunch and rest stops. 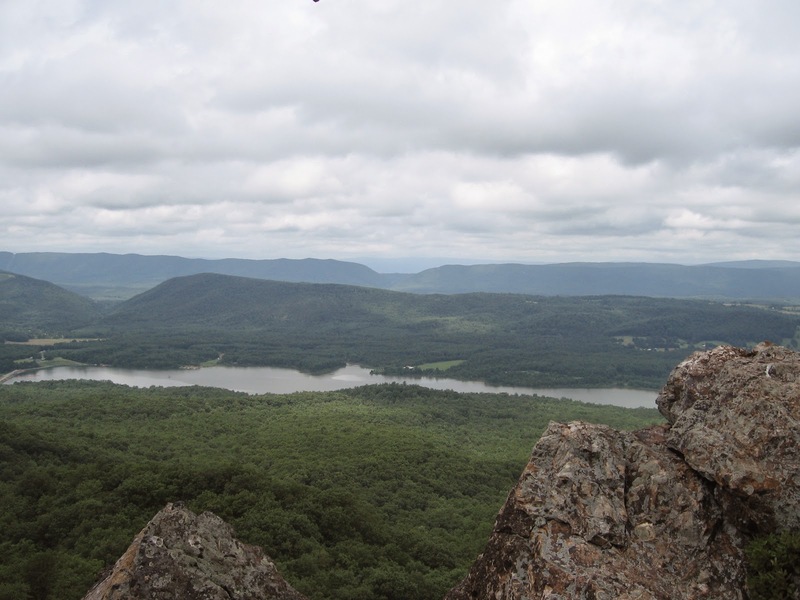 Two overlooks have names: Viewing Rock, which overlooks Lake Merriweather, and Jump Rock. Following the last viewpoint, we had to scurry down some rocks before we hit a long descent. The last part of the hike paralleled the Maury River. Brian Muszynski and John Brandt took the lead and placed some stepping stones to make it easier for the rest of us to get across one water crossing. Parts of our route were not well marked, and we were grateful that Andy, who had been accompanied by intrepid hiker Briana Taylor, had hiked the route twice ahead of time to scout it out for us. 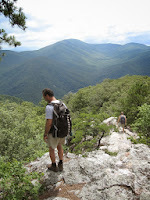 All told, our 8-mile route covered an elevation gain of 2,480 feet. The exertion required combined with the intense humidity to make the temperature feel quite toasty. We spent a few minutes after the hike cooling off by dipping our feet etc. into the water. An informal rock-skipping contest ensued, and Brian was declared the unofficial winner. Unfortunately, no prize accompanied the honor. Kelly O’Rourke, Marian Styles, Pete and Bev Fink, Eileen Seaman, and Michael Seth rounded out today’s group of 9. We had hoped to end our day at Just Kay’s Café for ice cream. Alas, Kay and crew were closed for vacation, so we resorted to a stop at a run-of-the-mill convenience store/soft-serve joint. 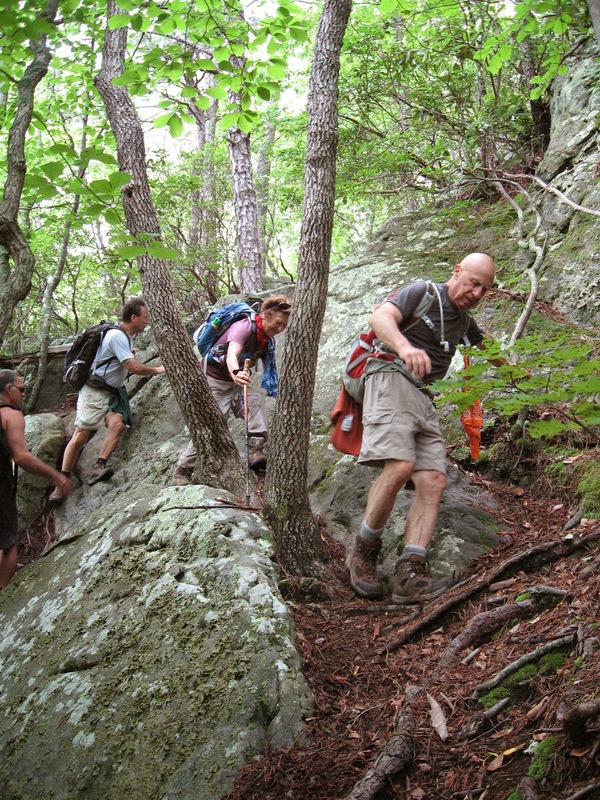 We had a group of 4 people on the hike around Lovingston Spring Trail and the AT. Liz Lyons, Jason Gale, Brian Muszynski, and Michael Seth all ventured out to try a trail that we had never hiked before. Liz and 3 nice men- she was not complaining!! Jason had hiked with us about 9 months ago. We were glad he joined us again. The weather started out nice as we began walking north on the AT. After about 2 miles, we turned left onto Lovingston Spring Trail. This is a trail that runs along Rockbridge County and does not get much traffic. It was relatively flat and provided a nice walk through the woods. We continued along this trail until we reached Lovingston Spring. We thought that this would be a nice lunch stop. 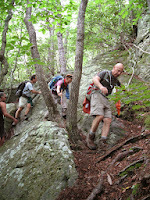 As Michael Seth looked at the map, he suggested we call this the "Three Counties Hike". We ended up traveling through Rockbridge, Nelson, and Amherst counties. After lunch, we kept hiking until we reached the intersection of the Lovingston Spring Trail and the AT. 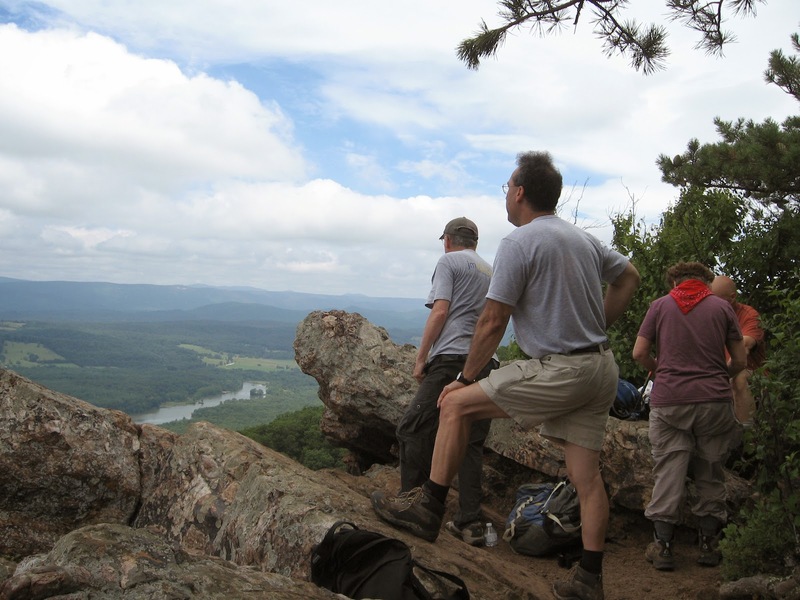 Michael Seth made the suggestion that we hike back along the AT to make this a circuit hike. Brian, Jason, and Liz agreed. We all had more energy left in us to complete what would become a 10 mile hike! 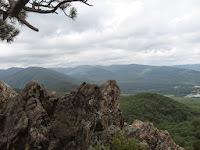 We then started south along the AT and encountered large rocks to climb upon with views of the valley. Brian Muszynski was happy to have a good view he asked for earlier in the hike. The walk along the AT was great. We had some stream crossings and good terrain. The adventure was yet to come, however! With 1.5 miles left in the hike, the skies opened up!! Pouring rain and lightning! Luckily we had 4 hearty hikers that could run the last part of the trip back to the parking lot. We all arrived back safely- soggy boots and all! July 4th weekend provided a great time for hiking in Shenandoah National Park. Big Run was pretty dry and the weather was hot, but this did not discourage hikers, as we had 16 willing souls. The parking area at Doyles River was overflowing and many had to park on the grass, as the Park was crowded. souls. Not to worry, most people were headed down the Doyles River Trail to the falls as we headed down Big Run on the opposite side of Skyline Drive. We did see several other hikes on the "West Side" but generally things were fairly quiet. The hike down was quick, then we reached the long uphill traverse to the lunch spot at "Times Square" trail junction. The heat influenced the final leg of the hike, as we continued on the Loop trail rather than taking the Fire road which would be in the direct afternoon sun. 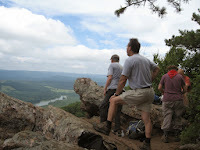 On the AT section as we crossed Doyles River Overlook, we observed a black snake climbing a tree. I had not seen that before. Shortly after, we were back at the parking area. We were fortunate to have friends of John Shannon from Australia, Grant and Sarah join us today. 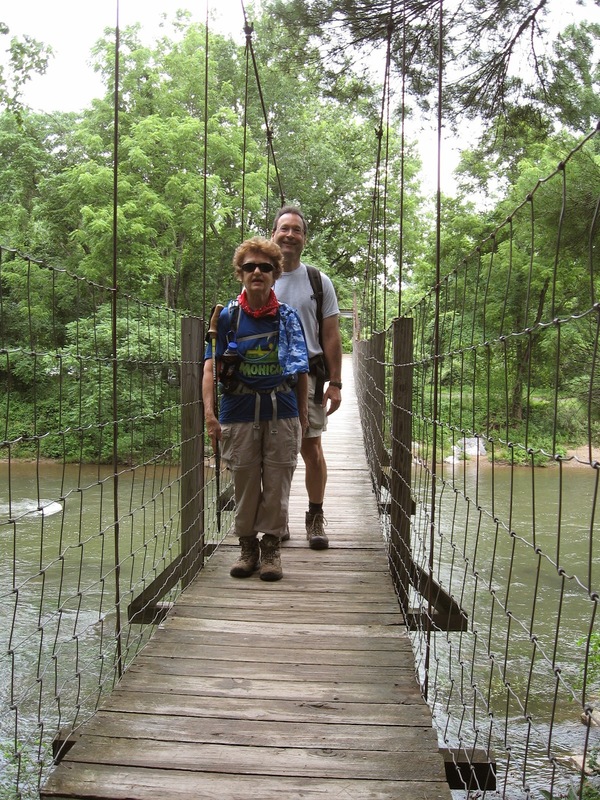 Other hikers included Pete Fink and Bev, Rita Kieffer, Kelly O'Roarke (and Bella), John Shannon, Brian Muszyinski, David Crow, Carrie Schriver, Marian Styles, Clay Lange, Ken Moss, Debra Fisher, and Michael Seth.